Angelina Jolie Begging Brad Pitt For One More Chance: Calling Off Divorce? It looks like Brad Pitt and Angelina Jolie’s divorce is in limbo. Angelina Jolie is apparently begging Brad Pitt to give her one more chance, even though she was the one who filed for divorce back in September 2016 after two years of marriage. That’s because her life is falling apart right now and she needs something – or better yet someone – to help her win back her fans. New reports indicate that Angelina is the one who has allegedly had a change of heart recently. According to Us Weekly, sources close to the couple say that they haven’t done anything to move forward with their divorce proceedings. 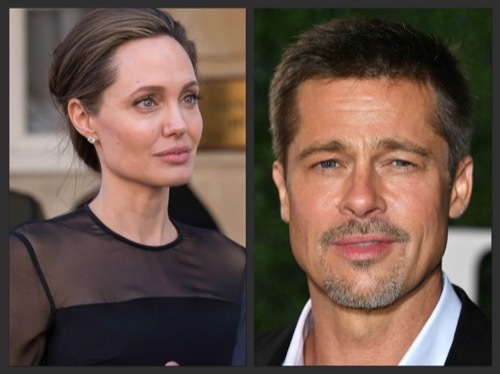 One of the reasons why Angelina Jolie might be asking Brad Pitt for his forgiveness is because both her personal life and her professional life has been in shambles. She’s at risk of losing her Hollywood reputation as a director because of the controversy surrounding her new film, First They Killed My Father. Many fans have lashed out at Angelina Jolie after hearing about her film’s exploitative and insensitive casting strategy. She’s also working hard trying to repair her tarnished reputation following her decision to split from Brad. Angelina somehow thought that airing all of her family’s dirty laundry would not backfire the way it did. Of course, Angelina Jolie is yet to make any comments about her future with Brad Pitt. But at the same time many critics believe that it’s doubtful that Brad Pitt would be willing to work on his relationship with Angelina Jolie. After all, he was subjected to one of the nastiest smear campaigns the celebrity world has ever seen. For a while it seemed as though Brad’s career was over after details about his alleged substance and alcohol abuse problems were revealed. If that weren’t enough, Brad has had a hard time gaining access to the ex-couple’s six children. Angelina Jolie took their kids, Maddox, Pax, Zahara, Shiloh and twins Knox and Vivienne to Africa on Father’s Day earlier this summer. Angelina hasn’t been willing to share custody of the children, leaving Brad very isolated from his family. Plus, a lot of fans believe that Brad isn’t the kind of guy that’s willing to make the same mistake twice. If there’s one person who knows how Angelina Jolie is behind closed doors, it’s Brad Pitt. He’s been there, done that and doesn’t want to go back there again. In the meantime, don’t forget to check back with CDL for all the latest news and updates on Brad Pitt and Angelina Jolie’s divorce right here. Angelina Jolie Divorce: Brad Pitt Fights Break-Up Rumors with Intense ‘By The Sea’ Publicity Tour? Marion Cotillard Pregnant: Actress Hides Baby Bump Amid Brad Pitt Cheating Reports And Angelina Jolie Divorce? Angelina Jolie Divorce Drives Brad Pitt Back Into Jennifer Aniston’s Arms? Brad Pitt’s Mental Breakdown: Actor In Tears Every Day Over Angelina Jolie Divorce – Prepares To Air Angie’s Dirty Laundry Soon? Prince William, Kate Middleton Forced To Cut Ties From Brad Pitt: Angelina Jolie Divorce Divides The Royal Family? Rihanna In Love With Brad Pitt: Singer Obsessed With Angelina Jolie’s Ex? Angelina Jolie Back With Billy Bob Thornton: Ex-Couple Reignite Romance After Brad Pitt Divorce?